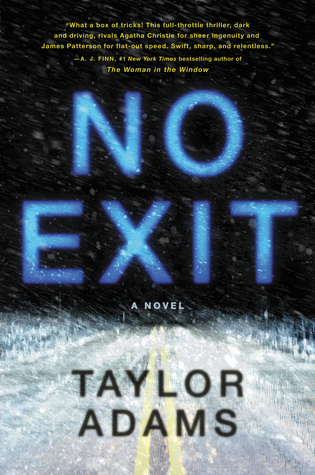 Happy Pub Day to Taylor Adam’s, No Exit! Synopsis: On her way to Utah to visit her dying mother, Darby Hall encounters a blizzard that leaves her stranded at a highway rest stop. On less than half a tank of gas, and a dying cell phone with no reception, she essentially finds herself stranded. Not only that, but Darby discovers that one of the four other travelers she encounters has a dark secret. By chance, she glimpses a child locked away in an animal crate in the backseat of a van. And so the horror starts to unfold as the questions race through her mind. Who is the owner of this van? And why do they have a little girl locked inside? Darby is determined to set this girl free, but in order to do so she needs to hatch a plan otherwise she risks endangering herself, the trapped girl, and possibly the lives of three other strangers. Final Thoughts/Recommendation: This book is stressful! Be prepared to dedicate an afternoon to reading because you will not be able to put it down. Taylor Adams creates a twisty-turny thriller that will have you holding your breath and gripping the pages until your knuckles turn white. If you’re in the mood for a proper thriller then definitely check this one out! I love your handwriting, it’s such a unique way to review books!